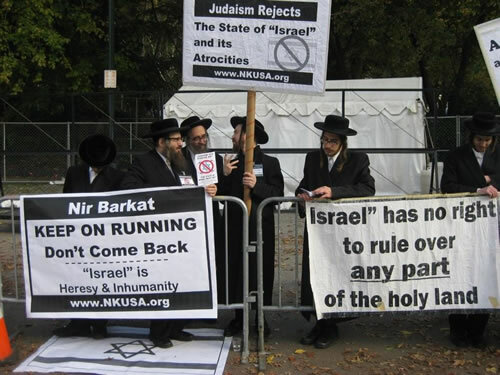 On Friday, Oct 30, 2009, Torah true Jews demonstrated in Central Park, New York City, to protest while Mr. Nir Barkat, the so called Mayor of Jerusalem, head a press conference in the 'Tavern on the Green'. Barakat is personally visiting New York to run in the New York City Marathon, to attract tourism to the occupied Jerusalem. Orthodox Jews declared that the State of "Israel" and its representatives hijacked Judaism and stole the identity of the Jewish people. 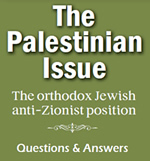 It denies Jewish teachings which forbid the existence of a Jewish State. It occupies the land of the Palestinian people and oppresses the religious Jewish communities in Jerusalem, as well, because of their opposition to the Zionist philosophy and the State of "Israel".